For our performance on Sunday, November 21st at Joy of Tango in Wayne, PA, Svetlana chose this song. It was a last-minute inspiration, but it seemed to work for both of us on many levels; and after the performance, the whole room was clamoring to know "what is that song!??" 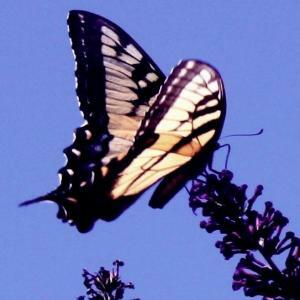 Svetlana knew the title as "Waltz of the Butterflies" and also a Russian-sounding name associated with it, apparently that of the song's composer. "Supposedly Seitkaliyev is the orchestra conductor of the St. Petersburg Lyric Ensemble. The album "Dance with Me" is only released in Turkey, meaning that the album is probably produced there, and the conductor's name is fake... The album is played repetitively in all of the music shops in Beyoglu (Pera) and Kadikoy in Istanbul." "From the Album "O Melissokomos", composed by Eleni Karaindrou . Its the song which﻿ has been playing for more﻿ then 5 years in a music store on the Istiklal Street at Istanbul." Is this the case? "O Melissokomos" (1986) is a film by Greek filmmaker Theo Angelopoulos. Eleni Karaindrou (b. 1939?) is a classicaly-trained Greek composer and pianist who has composed music to a number of his films. Has anyone seen this film? Someone called ahmtalex has posted this same song (in its most well-known version) on youtube, giving its title as "To Vals Tou Gamou" and also indicating that it is "From the Album "O Melissokomos", composed by Eleni Karaindrou. It's the song which has been playing for more than 5 years in a music store on the Istiklal Avenue in Istanbul." On that page, you will also find an accusation that Karaindrou stole this walz from a similarly entitled waltz by Francis Wynn (unlikely, but in the realm of the possible in musical history); as well as attacks on Greeks stealing knowledge from ancient Egyptians, and Turks stealing Istanbul from the Greeks. What a world we live in! There is the possibility of forgetting all these troubles when waltzing to a lovely melody. We at La Vida Del Tango would love to hear from anyone who has been to Istanbul, who has seen the movie "O Melissokomos" (also known as "The Bee Keeper") or who knows maestro Seitkaliev. The audio track is a version of "Waltz of the Butterflies" from a CD entitled "Cafe Anatolia." 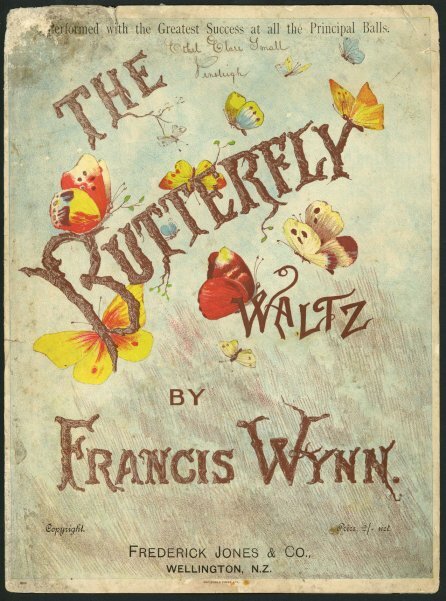 A piece entitled The Butterfly Waltz, attributed to Francis Wynn, was published in Wellington, New Zealand, ca. 1894. Source: Sheet Music Archive of New Zealand.